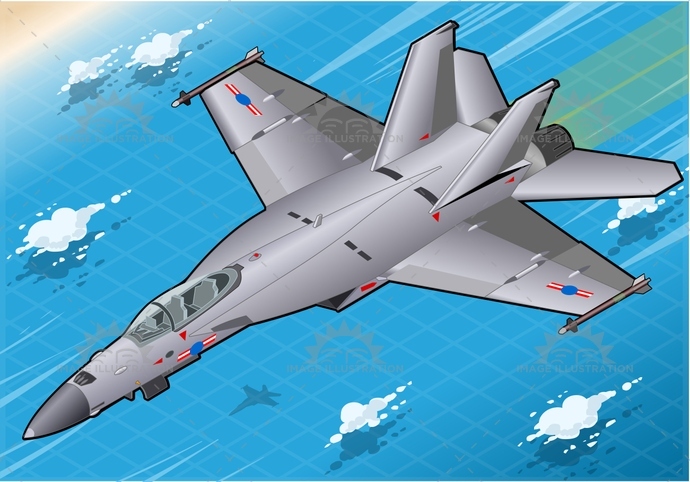 Stock product - detailed vector illustration - Isometric Vehicle Collection - Fighter Bomber 02 - created by Aurielaki. Image formats EPS AI JPG. Isometric Fighter Bomber in Flight in Front View . SKU: Fighter-Bomber-02-Vehicle-Isometric-AurielAki. Category: Militar Planes Vehicles 3D. Tags: aeroplane, aerospace, air, aircraft, airforce, airplane, aviator, bomber, defense, display, f-18, f18, fighter, fly, force, hornet, interceptor, isolated, isometric, jet, military, missile, navy, pilot, plane, speed, super, supersonic, technology, war.